Andy Rodgers was on form and on target against Ayr United on Saturday, keeping Toon's slim chances of a play-off place alive. 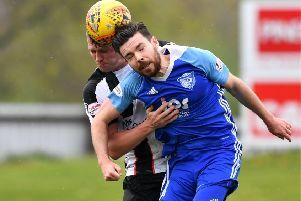 Peterhead put a dismal first half behind them when they came out of the dressing room after the break and score three second half goals to win against Ayr United. Ian McCall’s side had not won in seven games while Jim McInally’s boys were without an away win since January and it was the home side who looked set to put their poor form to bed after scoring twice in two minutes early on. A long ball by Adam Blakeman in the 18th minute found Alan Forrest who got behind the Peterhead defence, rounded Graeme Smith before tapping into an empty net from six yards. Then, 20 minutes into the game, Ayr doubled their lead when Nicky Devlin picked out Jordan Preston who finished from inside the box. Both teams had chances with Andy Rodgers looking dangerous for Peterhead while Ayr continued to bear down on Graeme Smith’s goal, forcing the toon stopper into a number of good saves. Then as half time approached Peterhead struck back when Rodgers headed in from a Steven Noble cross. There was just time before the half ended for Smith to make yet another crucial stop as he denied Jordan Preston a second after the Ayr striker was through on goal. Less than ten minutes after the break and Peterhead levelled through midfielder Jordan Brow, the former Aberdeen player also heading in from a Steven Noble cross, this time from a free kick. Ayr hit the crossbar with an attempt before Peterhead took the lead as Brown again scored after getting on the end of a Ryan Strachan through ball that the Ayr defence failed to deal with. Graeme Smith was kept busy through out the match but Gary McDonald secured the win for the visitors in the 76th minute when he chipped the ball over Ayr keeper David Hutton.